Constructed from commercial-grade, heavy-duty steel, this full motion TV mount is stable and durable. The smooth-motion, articulating design allows for tilting, swiveling, and extension to find the perfect viewing angle. Continuous motion is possible without the use of tools.Also it allows your display to be folded parallel to the wall, saving you maximum space ; or be extended up from the wall about 25.24" to provide space to pass cables and wires through for a clean and uncluttered look. Compared to other types of single stud TV mount , it's more stronger. Hang with us now! High-grade Cold-rolled Steel Construction provides safety loading. 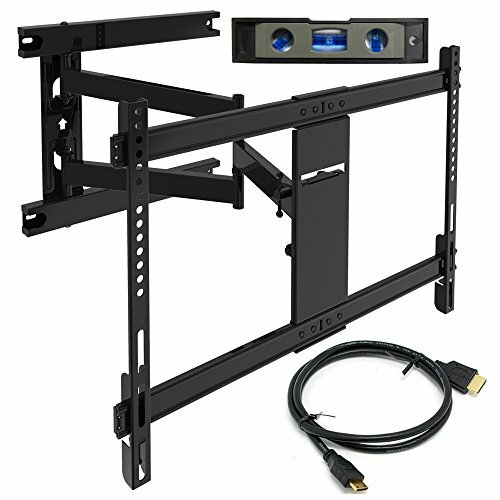 This wall mount tv bracket fits most of 32"-70" TVs up to 110 lbs with max mounting holes 600mm x 400mm. It holds your TV 2.36" from the wall and extends up 25.24 " out form the wall, yet still offers some tilt (+5°-12°) and 180° wide-angle swivel to improve viewing and reduce glare. Besides , ±4° Post-installation level adjustment allows the TV to perfectly level . It fits16" studs plus concrete wall typical in US homes . It can be mounted into all types of masonry. The screws in the package are supplied as standard. If your TV needs longer screws, pls. feel free to contact us. Provide with 5-year warranty coverage. EVERSTONE UNIVERSAL DESIGN - Fits most of 37"-75" TVs up to VESA 600 x 400mm and 110 lbs . CHECK these before you buy. TILT,SWIVEL,AND ROTATE FUNCTION - Retracts to 2.36" , extends up to 25.24" from the wall. Swivel your TV 180° to the left or right to get all the views your room could ever need. 12-degree and 5+degree tilt capability makes adjustments easy. 16 INCHES - Fits 16 " wooden studs plus masonry, not for dry wall alone. ±4°Post - installation level adjustment allows the TV to perfectly level . INCLEDE ALL NECESSARY MOUNTING HARDWARE - Easy installation with decent instruction, all installation and mounting hardware included. Comes with zip ties , spirit level and HDMI cable as gifts. The screws in the package are supplied as standard. If your TV needs longer screws, pls. let us know. WHAT YOU GET - Provide with 5-year warranty coverage. If at any time you are not satisfied with your purchase, please contact us. We will try our best to help solve the problem.